I applaud it when tradition is softened a bit and creativity is given a nod. 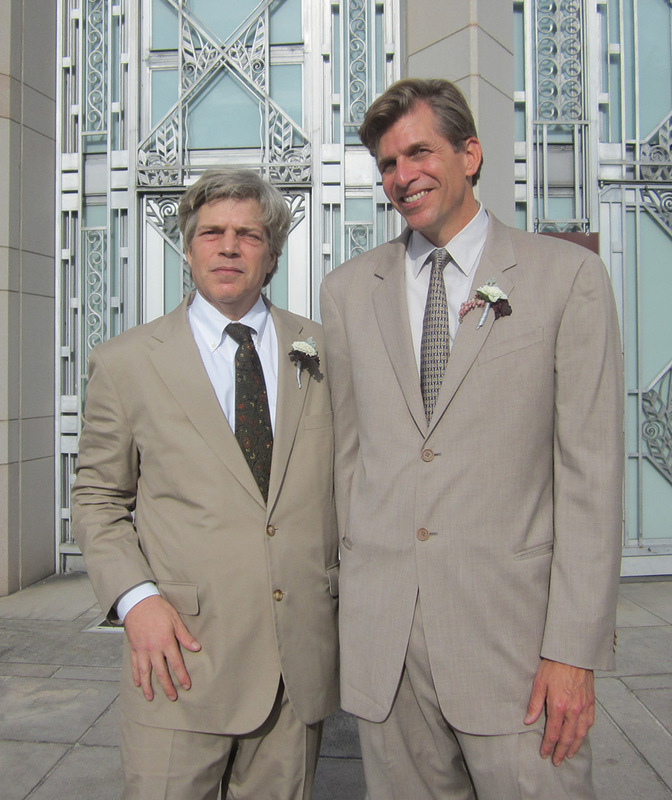 Groom Brian (r) and Brother David (l) look so handsome in their light colored summer suits. Brian sported matching shoes as well – just FUN! These two looked like something out of GQ! Additional creativity: Brian and Amy commissioned a Japanese Omikuji Tree built in a frame with beautiful branches that became the backdrop for our ceremony. Afterwards, guests had a playful time tying fortunes onto the tree! During the time leading up to this wedding, Amy was true to herself. She knew what she wanted and her creative talents worked overtime to sculpt just the right kind of day – on every level. And Amy kept her sense of humor throughout it all. We all teased her about the 30 pound train! (The dress is magnificent.) 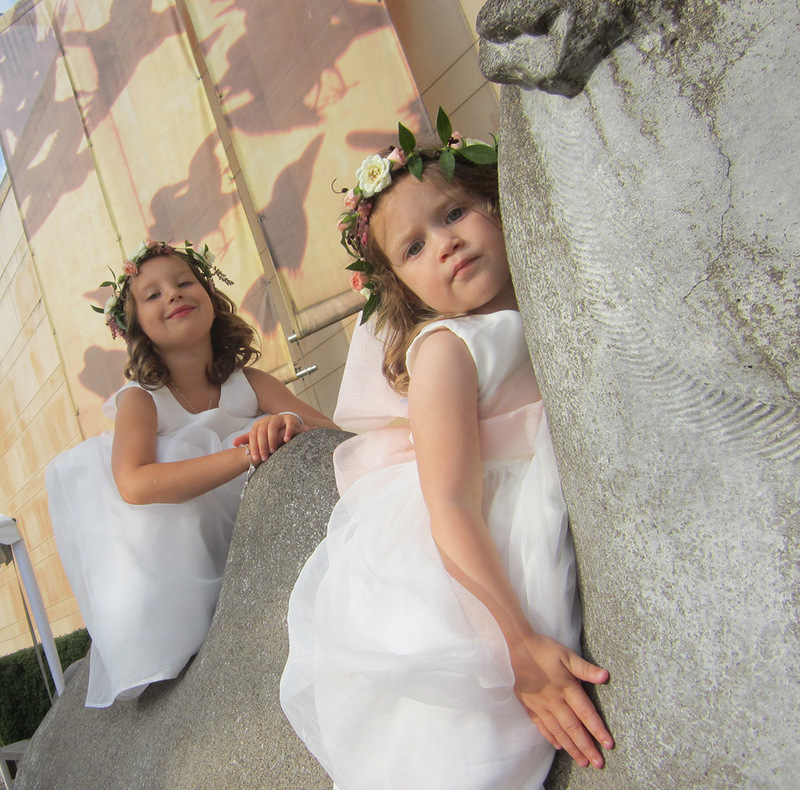 Her dream was to have her wedding at the courtyard in front of the Asian Art Museum with three types of live music – and it all flowed perfectly. It was a heartfelt service. Amy and Brian were such dedicated teammates. 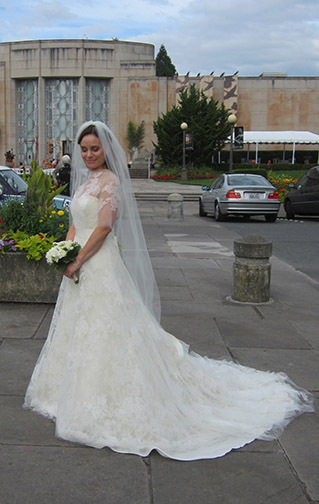 From Amy: ” You were such an integral and emotional part of our ceremony. I’m so glad I saw that photo of you in Seattle Bride. Your power and ability to love came through that photo. Just like when I saw Brian. Love at first sight.